Have you ever heard of a galette? It's a sort of free form pie, filled with anything that your heart desires. I was first inspired to make one when I stopped by to visit my friends, Dina and Tony. Dina was cooking up a storm (as always) and she had made an apple galette for dessert, which was SO delish! I thought "what could be easier?" It kind of takes all fear out of making a pie. So, I decided to make one too, only I chose blackberries and mangoes for the filling. The mangoes were SO juicy and ripe, and the blackberries were just as plump as could be. I thought, why not? So here it is. It's my own recipe and I hope you like it! Place fruit in a small mixing bowl. Add remaining filling ingredients. Gently toss until coated. On a lightly floured work surface, roll out the pie crust into a large circle. Carefully roll up the pie crust over your floured rolling pin, then unroll it onto a parchment lined baking tray. Pile the fruit mixture into the center of the pie crust. Spread it out a little, leaving a 2" border around the edges. Fold pie crust edges over the fruit. Brush the crust with an egg wash, if desired, then sprinkle with a little white sugar + a little cinnamon. 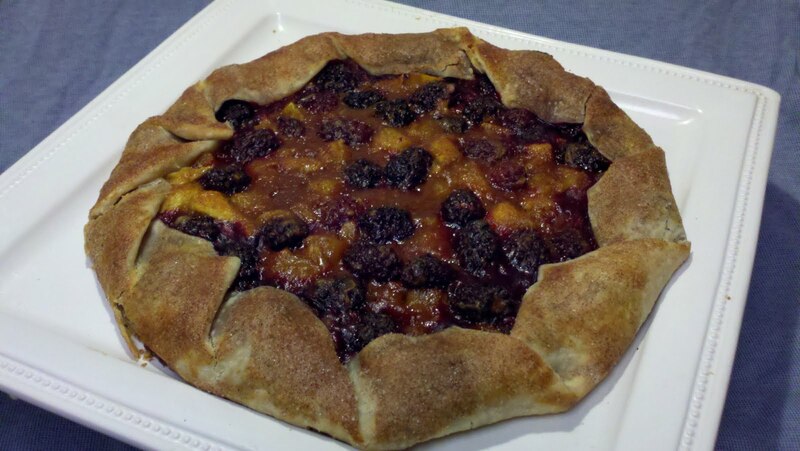 Bake for 30-35 minutes, or until the crust is golden and fruit is bubbly. Let it cool for 15 minutes before serving. Serve with a dollop of whipped cream or a scoop of vanilla bean ice cream. You can tell if a mango is really ripe when most of the peel becomes a deep red. If it's mostly green, it's not ripe enough. But go ahead and purchase it anyway, then let it sit in a paper bag at room temperature for 2 or 3 days until it ripens. Can't find blackberries? Use blueberries instead! Don't like mangoes? Use peaches instead! Btw, an egg wash is simply a beaten egg with a little bit of water added to it. When you brush it onto any bread or crust, it gives a nice golden shine to whatever you're baking.